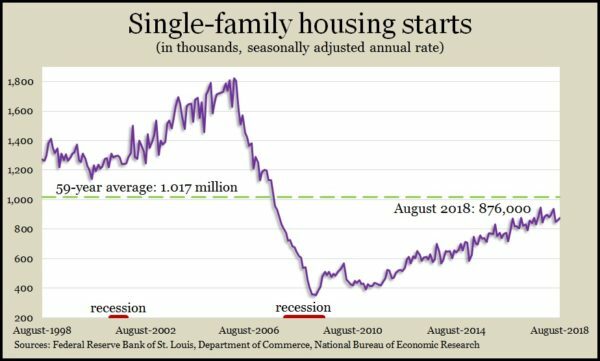 The housing industry got mixed news from a Commerce Department report that cited increased housing starts in August but falling building permits. The annual rate of new houses starting construction rose 9.2% from July and 9.43% from the previous August. It was the first gain in three months for housing starts, driven by gains in multi-family structures. Single-family starts remained elevated from levels just before the recession, but they were still 14% below the 51-year average. Meanwhile, the rate of building permits dropped for the fifth month in a row, suggesting upcoming slowdowns in residential construction. Sales of existing houses were unchanged in August, avoiding a fifth consecutive decline. The National Association of Realtors reported an annual rate of 5.34 million houses selling in August, down 1.5% from the year-ago pace. An economist for the trade group credited a recent lift in inventory for slowing a trend of insufficient supply, which has been forcing prices out of the reach of many home shoppers. The inventory of houses on the market rose 2.6% from August 2017. The year-to-year median price rose 4.6% from the year before, the 78th increase in a row. The four-week moving average for initial unemployment claims fell for the 10th time in 11 weeks to its lowest level since December 1969. Jobless claims were 42% below the 51-year average, according to Labor Department data, suggesting that employers continue to be reluctant to let workers go. The indicator has been a persistent sign of a tight labor market that has been boosting consumer confidence and spending. The index of leading economic indicators rose 0.4% in August, following even larger gains in July and June, leading to the barometer’s highest reading since March 2006. Although indicators have not been as robust as at the beginning of the year, they show widespread strength in the economy, suggesting continued solid growth in the months ahead, according to the Conference Board.